His Beatitude, Metropolitan Tikhon celebrated an opening Memorial Service for the victims of the Russian Revolutions of 1917 and their aftermath at Villanova University’s Corr Hall Chapel in conjunction with the opening of an exhibit titled “Blood and Soul” on Wednesday, February 8, 2017. The major exhibit, which runs at the University’s Falvey Memorial Library through September 1, highlights the 100th Anniversary of the enthronement of Saint Tikhon, the former Archbishop of North America, as Patriarch of Moscow in 1917, as well as the Revolutions that occurred the same year. See related story. At the conclusion of the Memorial, Metropolitan Tikhon delivered the following reflection on Saint Patriarch Tikhon and the important role he played in the life of the Church in America as well as his homeland. A photo gallery of the service and exhibit opening also is available on the OCA web site and Facebook page. I would like to express my thanks to the University of Villanova for the invitation to participate in the opening ceremonies of this exhibition—Blood and Soul: The 1917 Revolutions of Russia. This is not the first time that this fine institution has taken the initiative to address topics of such historical significance, especially those relating to the Christian Churches sojourning in those historical contexts. In particular, we are grateful to all those associated with the Falvey Memorial Library and the Russian Area Studies Program for their efforts in co-sponsoring this exhibit and a special thanks to Archpriest John Perich, who is curating a large portion of this exhibit and has provided many relevant archival and historical items from his own collection and from the Metropolitan Museum which is located at Saint Tikhon’s Monastery in South Canaan, Pennsylvania. This exhibit is taking place in this year when we celebrate the 100th Anniversary of the enthronement of Saint Tikhon, the first Patriarch of the restored Patriarchate of Moscow and All Russia, which had been abolished for two hundred years, since the time of Peter the Great. Even in the midst of the turmoil of the 1917 revolutions, and perhaps precisely because of the confusion that reigned in Russia at the time, the Orthodox Church saw fit to restore this ancient position of Patriarch, and by God’s providence, Saint Tikhon was elected to fill it. Before he became the Patriarch of Moscow and All Russia, Saint Tikhon was a great missionary of the Orthodox Church in our lands and is now known as the Enlightener of North America. 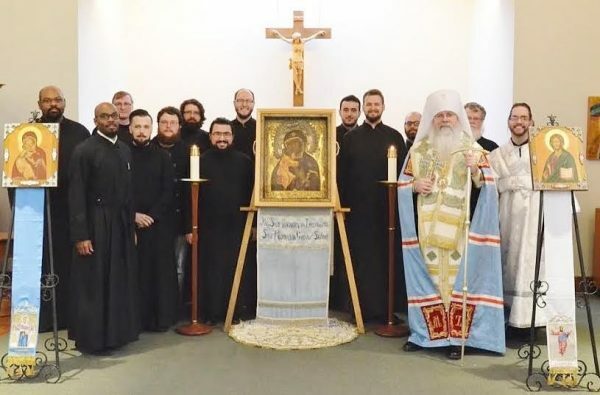 One of his greatest accomplishments was the founding of the Monastery of Saint Tikhon of Zadonsk, located adjacent to Saint Tikhon’s Seminary and, for today’s memorial service, we have had the privilege of hearing the prayerful singing seminarians from Saint Tikhon’s Seminary and Saint Vladimir’s Seminary, both of which are institutions of the Orthodox Church in America which hold firmly to the vision of Saint Tikhon for the Church in North America. Saint Tikhon was no hireling, but indeed a true shepherd who gave his life for his sheep in North America, just as he did during those times of terrible persecution and temptation. He remained steadfast in watching over his sheep and keeping them safe within the ark of the Church on whatever continent they found themselves and in whatever circumstances.